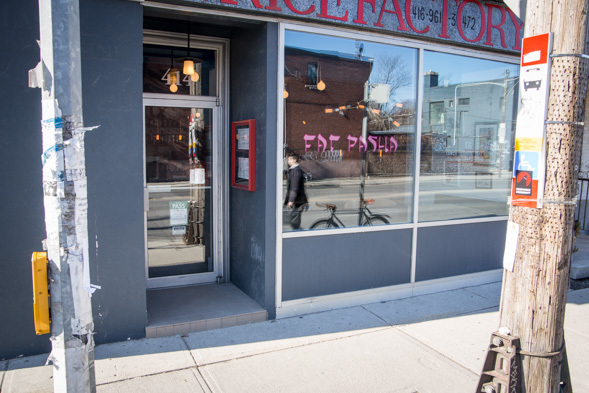 Fat Pasha, Anthony Rose's latest venture with partner Robert Wilder, is now open on Dupont in the corner spot once home to The Indian Rice Factory. 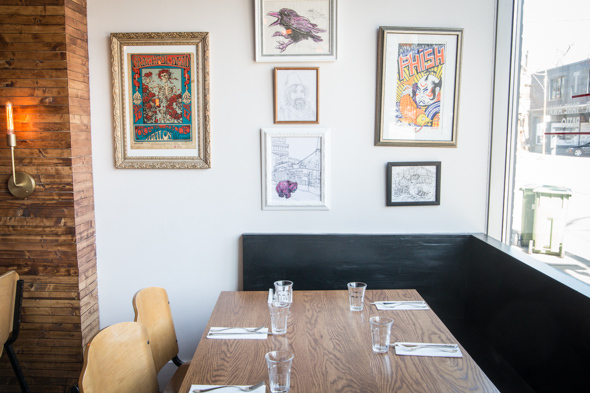 The 45-seat dining room by Palmerston Design features original artwork and a mural by Jeff Blackburn , plus psychedelic Grateful Dead prints from Rose's own collection. 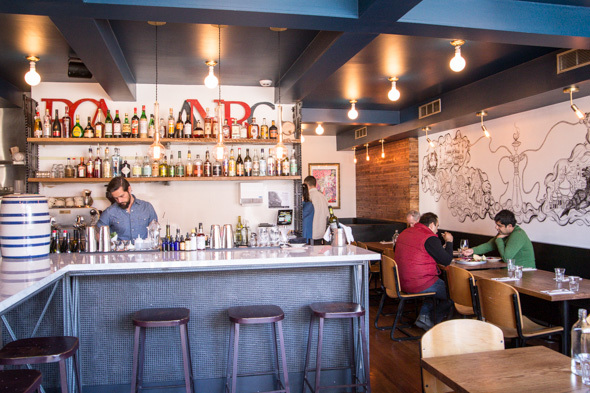 Seating consists of bar stools, groupings of two-tops and a couple deep booths. A little familiarity with Yiddish helps to decipher the chaotic one-page menu, which blends Israeli and Sephardic cuisines. Street foods like mezze spreads, salads and mixed grill options sit alongside Shabbat-worthy fare like whole grilled fish or latkes topped with caviar. The shawarma and mixed grilled feast can be ordered for $39 per person. 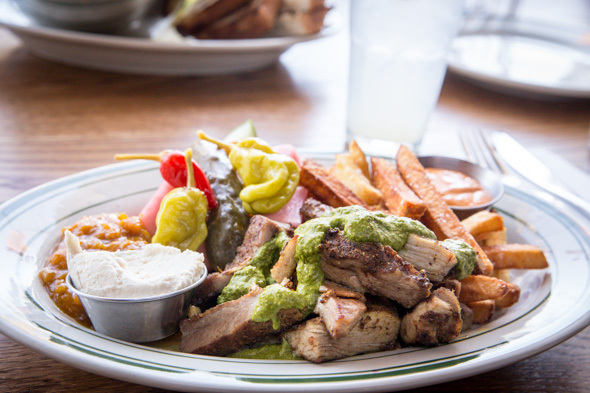 Singles can enjoy a scaled-back version on request that comes packed with grilled meats doused with skhug , thick-cut Yukon fries, smoked paprika mayo, mixed pickles, hummus and amba, a sweet apricot condiment. Israeli couscous ($14) dressed with date syrup offers an exchange of sweet and salty flavours, pairing dried fruits with salty olives and boldly spiced harissa to finish. 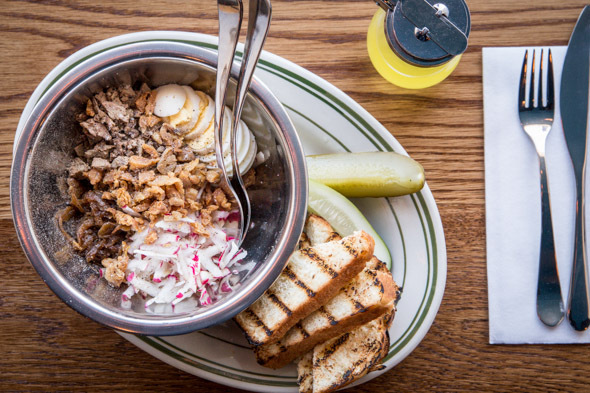 The "chopped liver a la Sammies Roumanian" is done in the style of the famous New York steakhouse ; it's beautifully composed in a deep bowl before being tossed table-side with warm schmaltz. I like this dish, a lot - so much so, that I give up on the grilled challah triangles and end up spooning it directly to my mouth. It's hand-chopped (rather than purĂŠed to pate consistency) and stirred with hard boiled eggs, deeply caramelized onions, crunchy fried gribenes (chicken skin cracklings) and fresh radish. It is certainly not diet food, and eating it like a salad is totally not advised. Beau's and Steam Whistle are on tap for $7 a pint, but more interestingly, there's a red and white from Norm Hardie on tap offered in ultra-accommodating half-litres ($35). 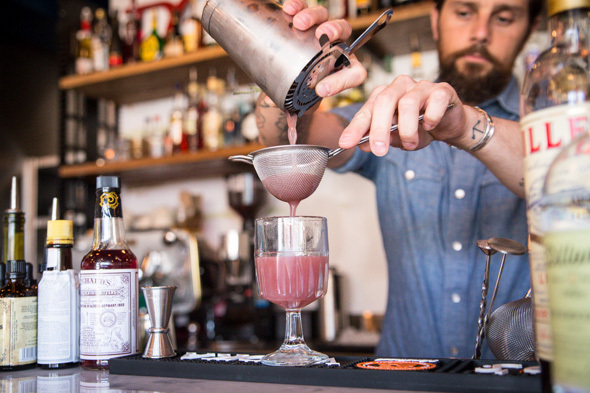 A Manischewitz Negroni is still in the works, but for now, there's the Mul on Rouge ($13), crafted with Dillon's gin, Lillet Rouge, Cointreau and grapefruit juice strained into an Arak rinsed glass. Fat Pasha is currently open week-round from 5pm. Expect the additions of a weekend brunch service in coming weeks, plus a 70-seat back patio with full bar currently in works.